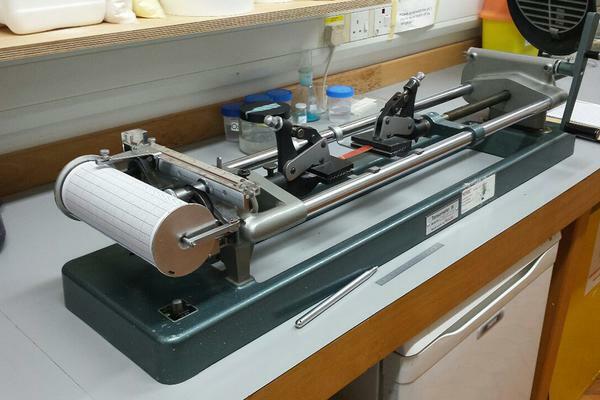 In our first semester, we are meant to design and carry out an experiment using our materials testing equipment. 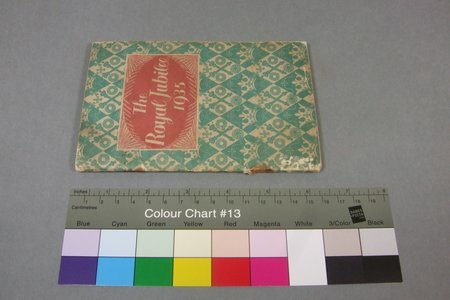 I immediately thought of a quote from the well-regarded researcher Betty Haines in the well-regarded book The Fibre Structure of Leather that claims that when "the thickness [of a piece of goatskin] had been reduced by about a half, the strength was reduced by five sixths. "* That seemed a little extreme to me, so I decided to test it experimentally. 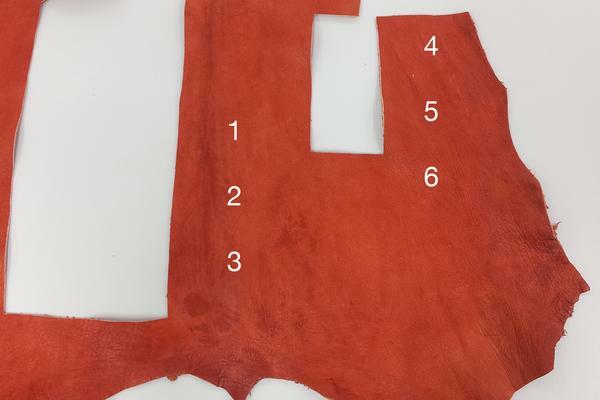 I adopted an incredibly rough goatskin from the workshop and cut some samples. 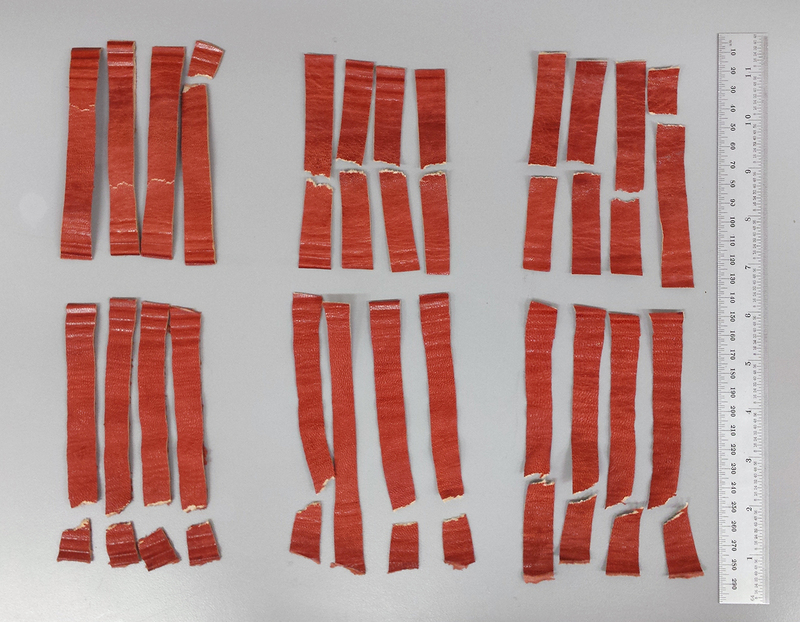 Three samples came from near the spine, which is the strongest and least stretchy part of the skin, and three came from the armpit/belly area, which is the weakest and stretchiest. These were about two millimeters thick, so I left two (one sample from the spine, one from the belly) full-thickness, pared two to 1mm, and another two to 0.5mm. 1–3 are from the spine, and samples 4–6 are from the flank. 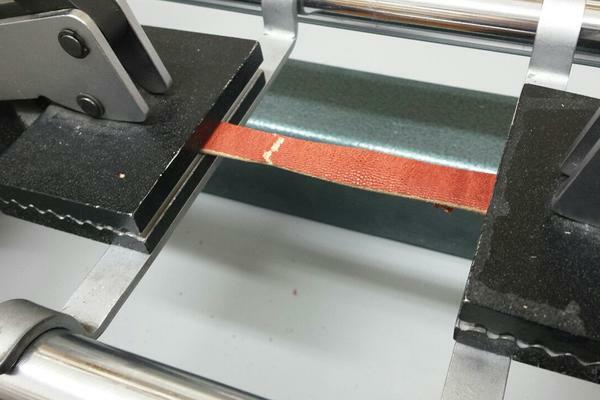 1 and 4 are full thickness, 2 and 5 are 1mm, and 3 and 6 are 0.5mm. I cut each sample into four smaller samples so I could put them in the excellent Monsanto tensometer. I clamped the sample in the jaws, twiddled cranks and levers and knobs until the mercury had no bubbles and sat at zero, and started turning the crank to stretch it. The mercury indicates how much force is being exerted, in Newtons, which are kilograms per square meter. You can nudge the carrier up and tap it to make a mark on the chart. I did not actually use the charts for anything, but I did produce a fair few. I only needed the final force it took to tear the samples for my experiment. 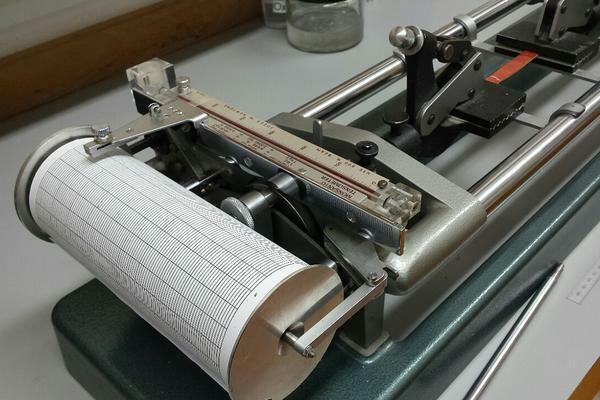 The machine has a set of interchangeable beams with varying give, so you can accurately measure how much force it takes to tear a piece of paper right up through how much force it takes to break a steel bolt. My experiment yielded some conclusions that ought to be obvious. It turns out that leather loses about half of its strength when it is halved in thickness. This is probably surprising only to me. 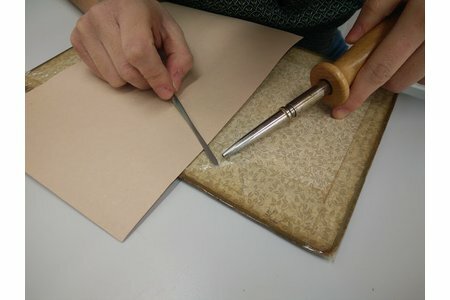 The logic was that since only the strong, fibrous corium layer is pared, leaving a higher proportion of weak grain layer, paring might weaken the leather more than expected. In this experiment, it does not seem to work that way. Halving the thickness halves the strength. The experiment with which I was comparing my results only mentioned two samples, and those broke under unusually low tension. Haines' full-thickness sample tore at the equivalent of about 75N, while mine all tore at over 400N. Her 0.6mm sample tore at 11N, while the weakest sample I tested broke at six times that tension, and that was an unusually low outlier. The average for 0.5mm samples was about 100N. At my assessment, David, the current books head tutor, said I might have used the very same skin Chris Clarkson, the former books head tutor, bought in reaction to the very same study. He was surprised by the values Haines was getting, and by the poor quality of the skins she used. He went to the best tannery in England to demand the roughest, toughest skin they could find. 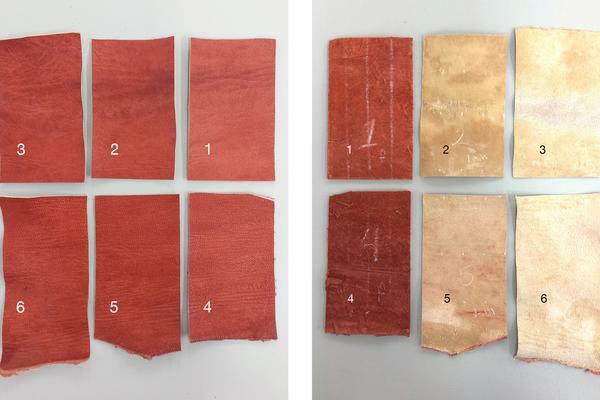 However, my samples did not seem appreciably stronger than all the other leather I have worked with, and when I tested a different skin before this experiment I got values within the same range. Thanks for your help, Chris Clarkson. I could not have done it without you and that excellent Tensometer you bought. I am glad that West Dean puts an emphasis on the scientific process and encourages us to design experiments with repeatable results. It would be interesting to hear if people in other labs have gotten similar results. 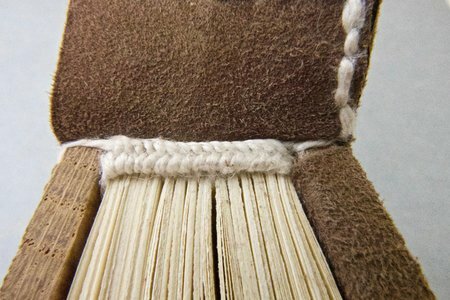 * "A goat binding leather that before paring measures 1.4 mm and tears at 7.5 kg: after paring to 0.6 mm the leather would tear at about 1.2 kg. The paring removes almost all of the corium tissue but whereas the thickness had been reduced by about a half, the strength was reduced by five sixths." Haines, B. (2006). The Fibre Structure of Leather. In: M. Kite and R. Thompson, ed., Conservation of Leather and Related Materials, 1st ed. Elsevier, p20.